Summer EDC was a major good time, y'all. And we didn't get rained out - HOORAY! We would've had this party rain or shine. Even if it was hailing! Okay, maybe not if it was hailing, but we didn't have to make that decision. The weather ended up being perfect. Big hugs to my partner in crime, Lexy of The Proper Pinwheel. She's amazing and talented and her creativity is what makes these parties so awesome. High five, girrrl. We had the BEST PIE OF MY LIFE from The Humble Pie Store: strawberry-rhubarb, apple cheddar, and cherry. Seriously. People of Denver, go immediately. The details of each event are my absolute favorite part. We had individually-sized pie boxes with wooden forks and baker's twine (for maximum cuteness) and mini bags of cherries. Thank you to Erin, Katie, and Annabelle (and her husband Cory!) for helping us set up the pie and cherries! You're all hired, k? I mean, it's not a picnic without lemonade... and strawberry lemonade... and cute cups & straws. It's just not. Our EDC-branded water was obviously invited back for round deux, and they made really great blanket weights. It got a little windy at times... but I was still able to rock my striped jersey dress. I know. Dress in the wind. I live right on the edge. For the create portion of the evening, we partnered with the crazy awesome folks at Fancy Tiger Crafts & October Ink to give everyone mini embroidery projects. The cherry design and faux wood embroidery hoops could not have been more perfect for our picnic theme. Lots of love to these local creatives! 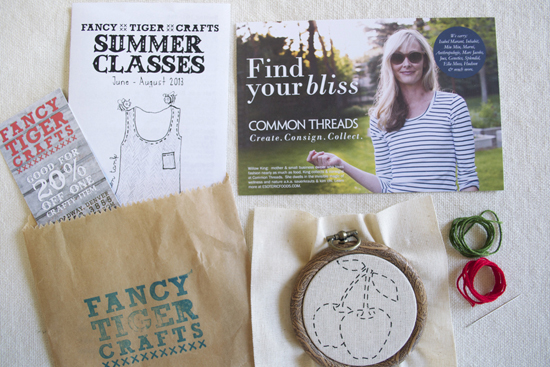 Speaking of local, we also teamed up with Common Threads to make this par-tay possible. Big thank you to these wonderful ladies for sponsoring our event and helping us celebrate the creative Denver community. If you're in Denver (or Boulder), check 'em out, yo. Their stores are FULL of cute clothes and accessories, plus they offer creative classes like sewing & knitting! Whimseybox - who just made the move out to Colorado, woot! - also donated 3 boxes of goodies for us to raffle off. I really really wanted to enter this raffle, guys. I'm so jealous of our winners. Congrats, you lucky ladies! Minted! Oh friends, Minted party decor is no joke. They donated the PERFECT party decor for our picnic. Exhibit A: an EDC bunting banner. That banner is going to live at my house forever and always. I love it. Oh-hoo-hoo! Now for the video. Annabelle of Evergreen Lane Productions is seriously one of the most talented ladies I know. She captures the mood & details of our events SO perfectly. HUGE thank you to everyone who came out! We had a blast. Thanks again to everyone listed here. We couldn’t have done this without these amazing folks. Srsly, say hi, follow them on twitter, send them love. Read Lexy's recap here and don't forget to check out the hashtag #eatdrinkcreate for more photos! A holiday EDC is already in the works, Denver. Stay tuned...! Photos by Petit Soul Photography; video by Evergreen Lane Productions; Eat Drink Create logo by Sarah Fritzler.